In the videos below, Shane from Reprezent explains his perspective on why a social media policy is important, and Dan from BCB outlines the balance between station and individual volunteers’ responsibility. A social media policy exists to try and ensure that potential problems don’t arise in the first place, but that if/when they do there are clear steps for addressing the problems, including any action that needs to be taken. A policy gives you a document to refer back to when things go wrong, especially if volunteers are involved. 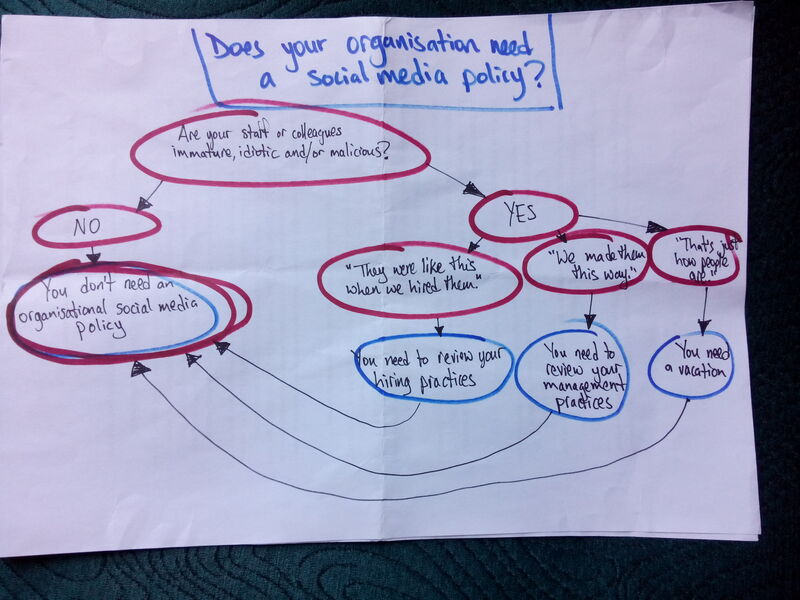 The image below shows a humorous questioning of advice that you need a social media policy – urging instead to trust in the people you hire and your management processes. It’s created (and we’ve included it) to be provocative, and to get organisations to think about cultural change. However, this makes a number of assumptions (e.g. that people tweeting are staff, rather than volunteers), and presupposes a specific organisational culture and constitution. On balance, we think it’s probably wisest to have a policy in place, to encourage your volunteers to use social media positively, and to deal with any issues that might arise (based on your policy). You probably already have something similar to a social media policy – i.e. your guidelines for broadcasters on your station. These guidelines will cover things like defamation, racism and other breaches of Ofcom’s broadcasting code. Social media is a platform for speech, so falls within the same guidelines for duty of care to other people, as well as the impact on the station’s reputation. If your station has a communication policy/strategy, this would also be highly relevant here. Use common sense: if you wouldn’t be happy to say this to a crowded room of people, don’t say it! If the station is criticised online, try to respond with respect for the other person and understanding of their perspective. If you are unclear on what action to take, contact a nominated station representative. You don’t have to reply to everything. See a sample social media policy here (Word docx) – and feel free to use and adapt it as you see fit. You might also benefit from taking a look at the BBC’s guidelines for staff’s personal accounts (summarised here) or Channel 4’s guidelines here. A sample social media policy here (Word docx) – and feel free to use and adapt it as you see fit.